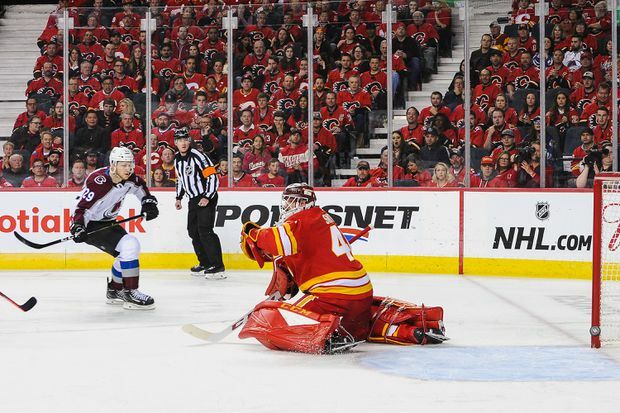 Nathan MacKinnon #29 of the Colorado Avalanche scores the game-winning goal against Mike Smith #41 of the Calgary Flames in Game 2 of the Western Conference First Round during the 2019 NHL Stanley Cup Playoffs at Scotiabank Saddledome on April 13, 2019 in Calgary. The Colorado Avalanche evened their National Hockey League playoff series against the Calgary Flames with a 3-2 victory in the first overtime period at the Scotiabank Saddledome on Saturday night. Nathan MacKinnon beat Flames goalie Mike Smith from the left side of the net with 11:33 left in the first extra period. The victory allowed Colorado to escape from Alberta without falling into a 2-0 deficit. Earlier, the Avalanche fought back from a 2-1 deficit and tied the game at 2 with only 2:39 remaining on a goal by J.T. Compher. They also had to kill a power play early on in overtime. Games 3 and 4 are in Denver on Monday and Wednesday. It was the Avalanche’s first victory in five games against Calgary this season and only their second in their last 11 meetings. Smith had 36 saves for the Flames but it was not enough. Philipp Grubauer, who won a Stanley Cup last year in Washington, had 35 saves for Colorado. Smith continued his mastery of the Avalanche through much of the game. The Flames came within 2:39 of winning in regulation. Sean Monahan had given them a 2-1 lead slipping a shot into the right corner net past the Avalanche goalie with 7:33 remaining. Calgary swept the regular-season series. The Flames had missed the playoffs in seven of the previous 10 seasons but finished with the second-best record in the NHL. The last time they were this good was 1989 – the only time they won a Stanley Cup. Smith was the star of a lively first period that was largely dominated by the Avalanche. Calgary’s 6-foot-5 goalie continued to repel shots from all angles, and at one point gave a stick across the back of the head to Derick Brassard when the Avalanche centre was pestering him in the crease. “Smitty, Smitty,” the crowd in the arena, a sea of red, chanted. Smith had 15 saves before the first intermission, the best when he stopped a breakaway by Gabriel Landeskog, Colorado’s strapping left wing. Another time, he snagged a quick wrist shot from in front of the net by MacKinnon. The Avalanche star had a career-high 41 goals and 99 points but he has been held off the scoreboard so far. The Avalanche had two power plays in the first but were unable to solve Smith, bringing them to 0 for 6 in the first two games. Plenty of ill will was exchanged with lots of shoving after whistles and gloves to the face. The period ended with all 10 skaters in a scrum along the boards. Flames centre Sam Bennett was in the middle of it and got called for roughing, giving Colorado another chance with a man advantage to start the second period. The Flames killed off that penalty, too, now for the eight straight time in the series, with Smith gloving a hard shot by Alexander Kerfoot. The Avalanche centre was so frustrated at being foiled that he jumped in the air. “Smitty, Smitty,” Flames fans cheered. Despite all of its chances on power plays, Colorado cracked the scoreboard for the first time in the series on a short-handed rush by Matt Nieto with 12:44 remaining in the second. It came on their 19th shot and 45th against Smith in two games. The Flames weathered another penalty — this time Smith accidentally flipped a puck over the glass for a delay of game — and then tied it at 1 on a power play of their own. Defenceman Rasmus Andersson, one of five Swedes in Calgary’s lineup, netted a shot from in close on the left side of the net off a lovely backhanded pass from Bennett with 7:34 left in the second. Andersson had only two goals in 79 games in the regular season. Smith has lost only once in regulation time against Colorado in 17 games in his career. His career is an example of how difficult it is to reach the playoffs. He has played 571 games in regular season over 13 years, but has reached post-season only twice. Saturday’s game was only his 21st in the playoffs. In his last appearance in 2012, Smith carried the Phoenix Coyotes to the Western Conference finals. when he posted a 1.99 goals-against average and .944 save percentage over 16 games. He stopped all 26 shots he saw in a 4-0 victory on Thursday while becoming the first Calgary goalie to have a shutout in the opening game of a playoff series, and only the fourth in NHL history to record a series-opening shutout at age 37 or older. It left him in impressive company. The others were Gump Worsley, Tim Thomas and George Vezina. The first and last are in the Hockey Hall of Fame. “There have been a lot of goalies that have played playoff games so it is cool to be among them,” Smith said earlier Saturday. He now has four shutouts in postseason. Mark Giordano, Calgary’s 35-year-old captain, expected the Avalanche to put up a hard fight, and he got one. “We want to protect home ice and they are going to be that much more desperate,” he said. Colorado had expected to play better than it did in the first game of the series. It went 8-0-2 in the last 10 games of the regular season to clinch the second wildcard berth. The Avalanche was six points out of the second position before earning 18 of a possible 20 points over the last 19 days. The Avalanche re-decorated the visiting dressing room at the Saddledome to make it seem as homey as possible. They posted signs everywhere. “It’s an Awesome Day for Mile High Hockey” one reads. “It Starts Here” reads another. "We have to find a way to beat Smith,” Mikko Rantanen, Colorado’s star forward, said earlier Saturday. It took a while, but they did. Grubauer went 7-0-2 in his last nine starts of the regular season with a .953 save percentage. He was 9-2-2 in his final 14 appearances with three shutouts. “He is the reason we are standing here,” Landeskog said.